Made with 100% goat milk for even more benefits! 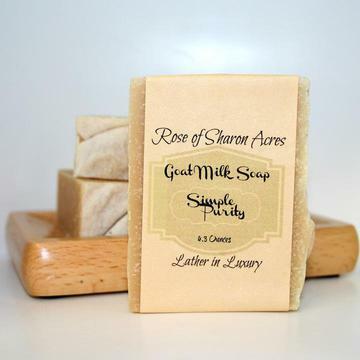 Pure and natural goats milk soap with no fragrance added. 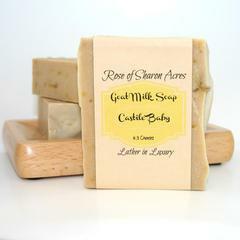 The benefits of goats milk in skin care has been known for centureis. Pure goats milk soap has been recommended as the best soap for psoriasis and eczema and those with sensitive skin issues. 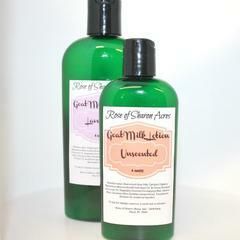 Toddlers, children, teens and adults with eczema will benefit from this all natural milk body soap. No chemicals or fragrances have been added to this soap and it has been made by hand in small controlled batches. This bar is an excellent choice for those with sensitive skin - especially those very young/very mature loved ones! Remember, everything you place on your skin seeps through skin cells - make sure its pure and natural! Wow, fast shipping! I can't wait to try this soap. After the great results I had with the facial soap, I am sure this soap is going to help me immensely with my super sensitive skin. This is a great seller you can't go wrong with. The products are wonderful, outstanding customer service, and it is so nice to know that your soap is coming from happy goats! :-) Thanks again! Eczema relief for 3 year old! Great lather; great un-scent. So mild and soothing. Leaves my skin fresh and soft. Let's face it ladies, summertime can mean a lot of irritating perspiration and this soap is so soothing to the most delicate areas. Shop around on the internet and you'll find Rose of Sharon Acres has generous "servings" at better prices. I'm glad I found you!